A 48 yo male with a past medical history of strokes. Most recently pt was admitted to neurology service for aphasia. Old bilateral middle cerebral artery territory infarcts were identified. Trans-esophageal echocardiogram reveals a 2 mm mass in the anterior leaflet of the mitral valve. The diagnosis is cardiac papillary fibroelastoma. 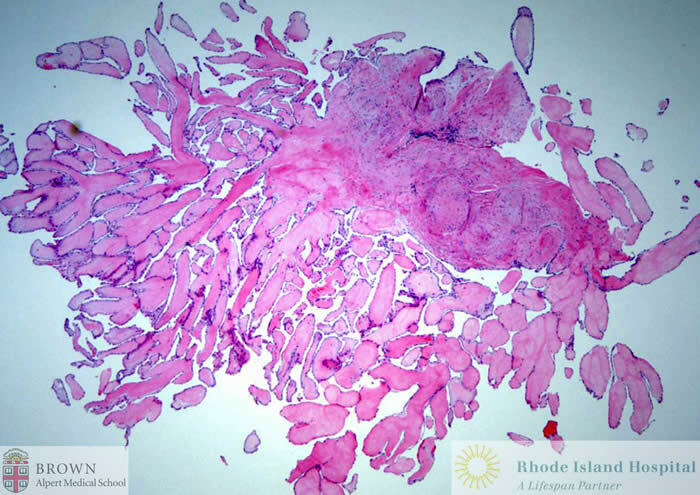 Cardiac papillary fibroelastoma is a rare, benign cardiac tumor. It is the third most frequent primary cardiac tumor, after myxoma and fibroma and it is the most common primary tumor of heart valves. The location of tumor in the heart is very important because of its potential to embolize. Left-sided tumors may cause stroke.